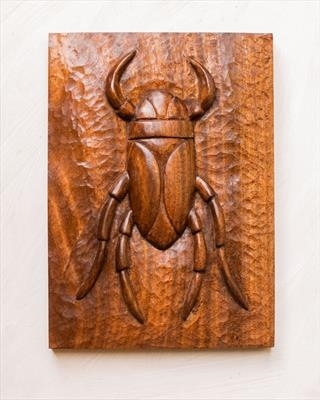 Carving of an aquatic insect. The wood is possibly African Walnut, which is not a true walnut. The grain of the wood is very noticeably interlocked. Finished with Tung oil and beeswax polish. Carved from another drawing derived from an illustration in a volume of an 1896 edition of the Royal Natural History.